We want to help you to stay prepared for hurricane season and extreme weather throughout the year. 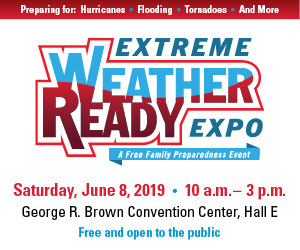 Below you will find useful information and safety tips that will prepare you and your family on how to respond to and recover from the effects of extreme weather. A fifteen minute instructional video has been developed by Ready Houston to help you prepare for a disaster. The DVD is available in English, Spanish, Vietnamese and Chinese. To request your FREE copy of the DVD, click here. Keep informed via Twitter and Facebook before, during and after a storm. Use #hurricaneworkshop. 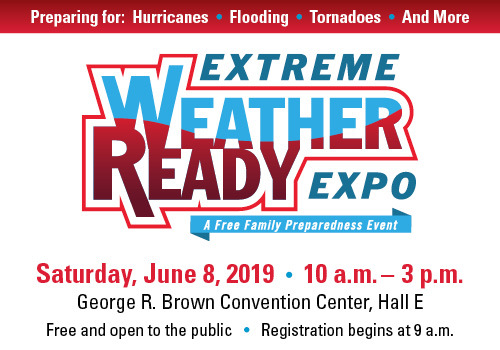 The following flyers and images may be used to help promote the Extreme Weather Ready Expo, so long as you do not modify them in any way. If you wish to help promote the Expo but need different materials, please contact us and we will assist you.